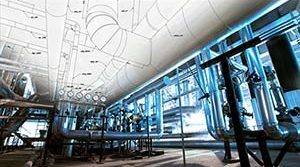 Constant Spring Supports Archives | Piping Technology & Products, Inc.
PT&P custom designed and manufactured constant spring supports for a chemical plant in Singapore. The constants are fabricated from A36 carbon steel A36, and include alloy coil springs. The dimensions are 15-¼” W x 17″ H x 46″ L with 9-¼” OD. They were designed for an operating load of 2,379 lb. and movement of 10” upward. These constants were designed specially with “telescoping cans” and painted to protect against corrosion. Standard load and travel tests were performed prior to shipment. 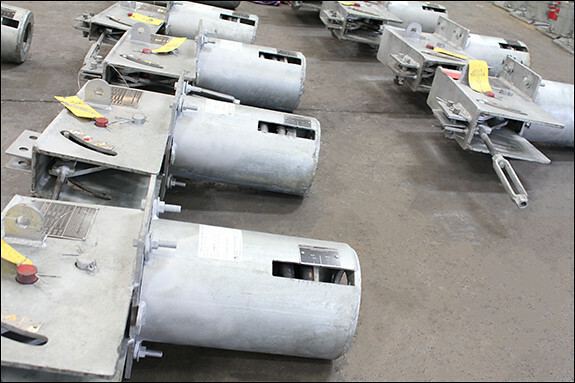 PT&P custom designed and manufactured constant spring supports for a main stream system at a power plant in Egypt. The constants include alloy clamps designed for a 900 mm (approximately 36” dia.) pipe. They are 48” H x 57” L x 24” W and designed for an operating temperature of 1070°F, with 7-1/2” total travel from the cold position. The constants are fabricated from A36 carbon steel and include a hot-dip galvanize protective coating. They are designed for an operating load of 24,712 lb. The constants have been modified to accommodate a specialized spring coil and modified casing. Standard travel and load tests were performed prior to shipping. 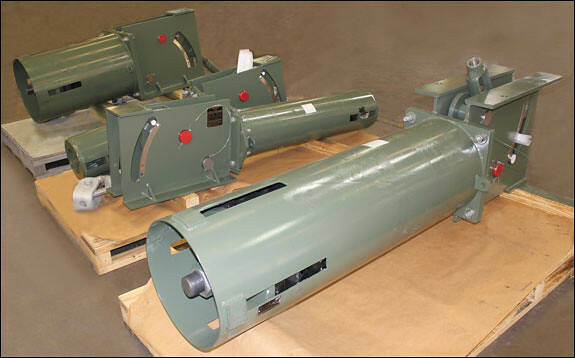 PT&P custom designed and manufactured ten 200 U-Type constant spring supports with slide plates for a Oil Refinery in Texas. They are fabricated from A36 carbon steel with an HDG finish for plates, angles, and cans. Its dimensions are 31″ in height and 52″ in length with 19” in width. 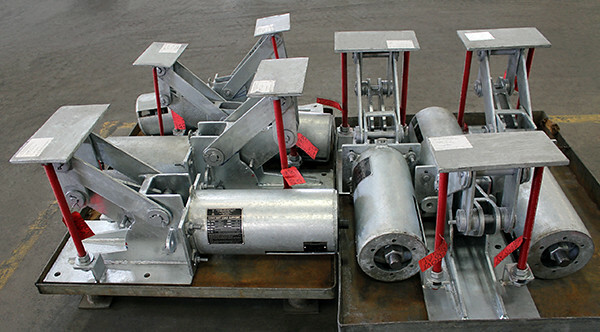 They are designed for a movement of 3 ½” up to 9 ½” and an operating load of 1100 lbs up to 4800 lbs. They were custom designed to match the box dimensions of a competitor. The units had a Standard Load Test performed prior to shipment. Design: 750°F | 1-1/2″ Total Travel | 29-1/2″ x 85-1/4″ x 34-1/2″ | 187,393 lb. PT&P custom designed and manufactured big ton constant spring supports w/ bronzphite® slide plates for a 400 KTA light oil for a processing and utilization unit at an oil refinery in China. A total of four constant assemblies were fabricated from carbon steel and hot-dipped galvanized for extra protection against corrosion. The bronze plate acts as the bearing surface, supporting heavy loads, while the graphite inserts provide a solid, oil-free sliding surface. 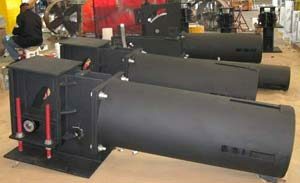 They are designed for operating temperatures up to 750°F and an operating load of 187,393 lb., with 1-1/2″ total travel. Load and travel testing was performed prior to shipment. 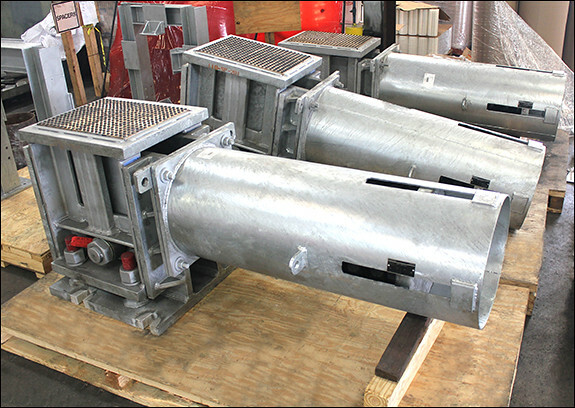 PT&P designed and manufactured 48 constant spring supports for a power plant in Mexico. The constants pictured above are Fig. 200 U-type constant spring supports fabricated from A-36 carbon steel and include PTFE, 25% glass filled slide plates bonded to the load flange. The supports are 39″ H x 26″ W x 80″ L and are designed for operating loads up to 8,200 lb., with a total travel of 11-1/2″. These are horizontal constants designed to support piping from below in conjunction with a pipe saddle. All the constants went through standard load and travel testing per MSS Standards prior to shipment. Piping Technology & Products, Inc. designed and manufactured C-type constant spring support assemblies for a refinery in Texas. The constants are 25″ in height, 17-3/8″ in length, and 11-5/8″ in width. Their load capacities range from 981 lb. to 1828 lb., with a vertical movement ranging from 2-1/2″ to 3″. All constants were fabricated from A-36 carbon steel with a hot-dipped galvanized finish, and underwent standard load and travel testing per MSS Standards prior to shipment. 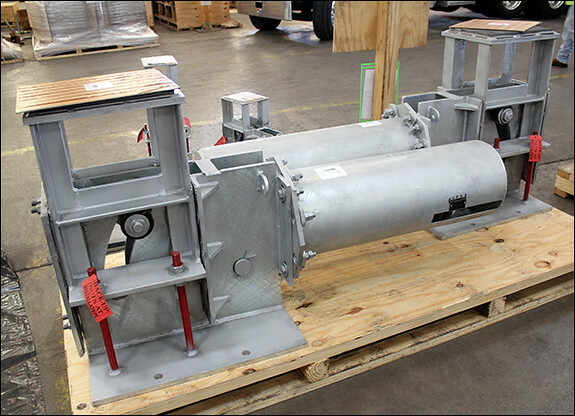 PT&P designed twelve constant spring support assemblies for a chemical plant in New Jersey. The assemblies will be used as replacements in a recuperator up-leg and down-leg application in conjunction with custom cross-over supports previously fabricated by PT&P. Physical sizes of these constant assemblies range from 18-1/2″ x 22″ x 64″ to 18-1/2″ x 26″ x 83″. Operating loads range between 8,000 lb. – 19,000 lb. and each allows for upward movement between 6″ – 9″. The spring coils are coated with epoxy instead of the standard neoprene coating. 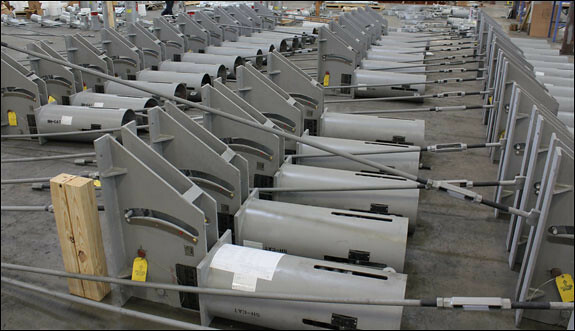 Standard load and travel tests were completed prior to shipment. PT&P designed and fabricated U-Type constant spring support , with PTFE, 25% glass filled side plate for a Polypropylene Plant in Texas. The constant is fabricated from carbon steel, and hot-dipped galvanized for extra protection against corrosion. The vertical movement is 1.5″ total upward travel and is capable of supporting a 10,350 lb. load. The constant underwent standard load testing prior to shipment. This Webinar will focus on the different types of constant spring supports. Learn about the special features available, in addition to the design of a constant support. View how the different cam/coil configurations produce a unique response to an applied load. Discover the step by step process used to size a spring for your application. Learn about the different attachments, testing, and installation and maintenance procedures. View examples of failed supports provided by our Field Service Division and learn why they failed and how to prevent it. Gain knowledge of the valuable tips used when deciding to adjust or replace a constant spring support, as well as shutdown and isolation procedures. 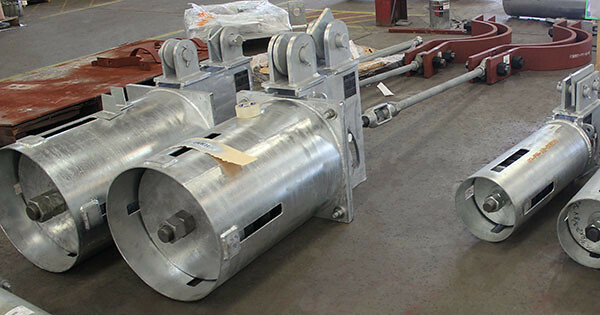 PT&P fabricated constant support assemblies for a power plant in New Mexico. 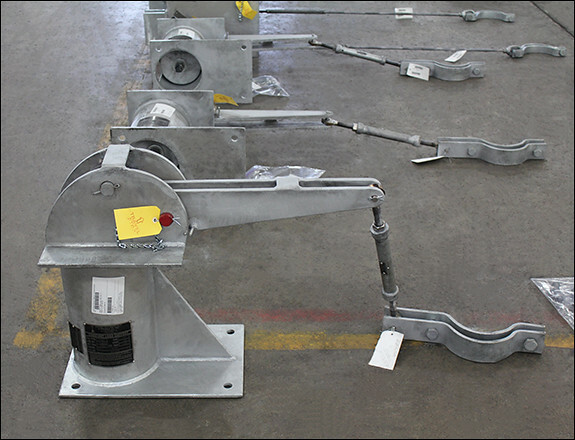 The constant assemblies will be used in conjunction with structural supports also provided by PT&P. Operating loads range between 7,000 lb. and 20,000 lb. and designed for movements from 10-1/2″ to 12″. All thread rods were coated with rust prevention compound and the constants were painted with Intergard® 475 HSS. The travel stops are wired to the constants frame and can be reused to lock the constant, preventing travel during plant maintenance or shutdowns. Standard load and travel tests were completed according to MSS standards prior to shipment. 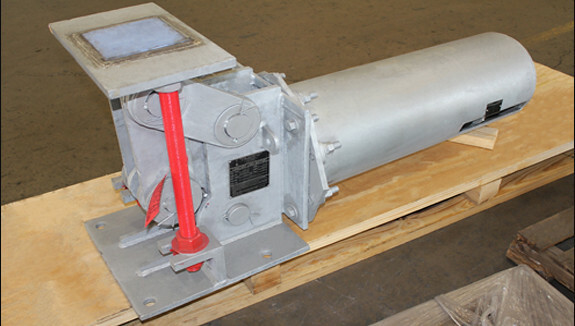 PT&P designed 100-F type constant spring supports for an oil refinery in Alabama. 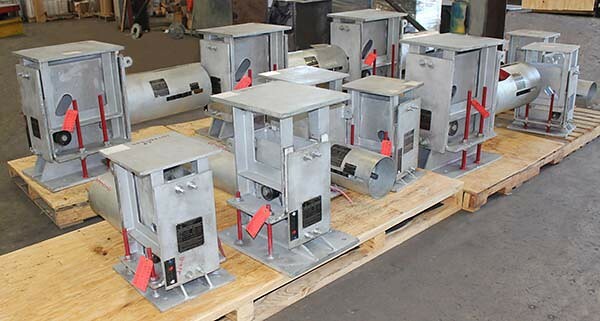 These custom constant spring supports are 32” x 12” x 23.5” and designed to support an operating load of 650 lb. with 14” of total travel. The constants are fabricated from A36 carbon steel and the coil is from 5160H alloy material. Standard load and travel testing were completed to ensure the quality and performance of these constants. PT&P manufactured Fig. PTP 100-E constant spring supports for a steam methane reformer plant project in Thailand. The constant springs are designed for a pipe operating temperature from 650°F to 1250°F and an operating load of 3,355 lb. with a movement of 13″ upward. The constants are fabricated from carbon steel and painted with an epoxy for high temperatures. Standard load and travel test were completed prior to shipment. PT&P designed Fig. PTP 200-U upthrust constant spring supports modified to accommodate an increased installed height. PT&P fabricated these constant assemblies from A36 carbon steel. They were designed for temperatures up to 185°F, and a load of 15,737 lb. 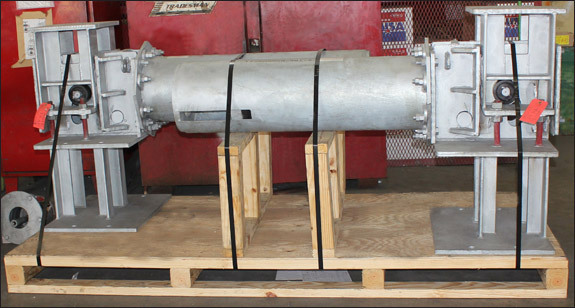 The constants are capable of a downward total travel of 2″ and are 61″ L x 25″ W x 39″ H. Standard load and travel tests were conducted prior to shipment. 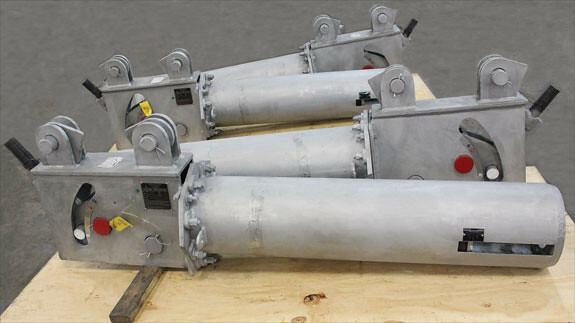 PT&P manufactured B type constant spring supports for a hydrocracker application at a refinery in Port Author, TX. 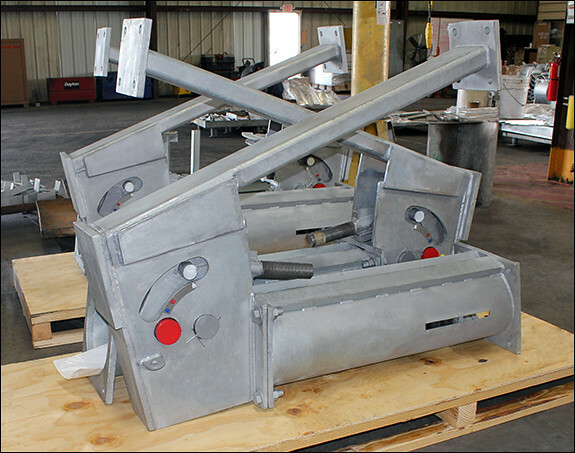 These custom designed constants are 83″ x 41″ x 20″, and designed to support a 53,000 lb. riser pipe through two trunnions. The constants are designed for an operating load of 26,700 lb. with 10-1/2″ of total travel. They are fabricated from A36 carbon steel and underwent standard load and travel testing prior to shipment.